Two hundred years ago today, Saturday, Stromness was officially decreed a Burgh of Barony. Per Mare development officer Kirsty Groundwater at this afternoon’s launch event. 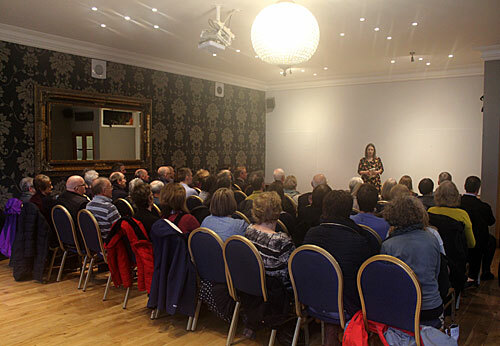 This was followed by an event in the Royal Hotel, where the invited audience heard about some of the plans for the year. Among those addressing the gathering were Councillor James Stockan, local historian Bryce Wilson and the Stromness Museum’s Kathleen Ireland. Stromness was created a Burgh of Barony in 1817, after a hard-fought battle, led by the public-spirited merchant Alexander Graham, to free Stromness from taxation by the Royal Burgh of Kirkwall. This legal victory by a small town against a Royal Burgh was the first of its kind in Scotland and paved the way for others to follow. No longer could Royal Burghs depend on the law to enforce their privileges of taxing other towns for foreign trade. But 2017 is a special year for Stromness — for a number of other reasons. 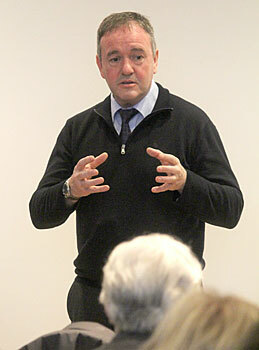 Councillor James Stockan urged all the folk of Stromness to get involved in the town’s “special year”. It also sees the 150th anniversary of the Stromness Lifeboat; the 180th anniversary of the Orkney Natural History Society, which runs the town’s museum; the 50th anniversary of both the Nav School and youth club; and tenth anniversary of the extension to the Pier Arts Centre. With this in mind, it is hoped the Per Mare celebrations will encompass all these anniversaries and more. Development officer Kirsty Groundwater said that, although there are events running all through the year, they are looking to see Per Mare as a homecoming event, with many of the larger events taking place in the week following Shopping Week. She added: “I’m delighted to get our year of celebrations under way this weekend, on a date which marks exactly 200 years since the town began to take control of its own affairs. A united service of thanksgiving will be held in the Stromness Church at 11am tomorrow, Sunday. The service will bring together the congregations of the Church of Scotland, the Baptist Church and the Episcopal Church to mark this milestone in the town’s history.During the service, Baptist Church member Cameron Stout will read the original decree. <Previous PostSo you want to be a Councillor? Find out more . . .